Oil paints in any desired colors. Monochromatic or limited palette often works best. Good air circulation and possibly a mask to help minimize smell & impact of enamel fumes. Larger pieces may need walnut or safflower oil as a medium to help slow the drying (and therefore working and blending) time for the oils. Dip brush into the cleaning solution first, to help create a layer between the bristles and the paint that will make cleaning easier later. Start mixing equal parts of the enamel and linseed oil with a base oil paint color. 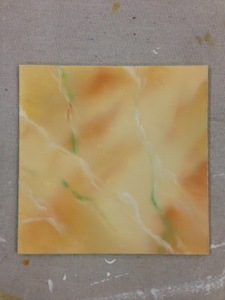 Blot on areas of another color, to simulate layers of veins within the marble. Use the soft hake brush to blend the vein layers deeper into the base color. First, brush in the direction that you want the veins to go. Softly blend further in the opposite direction for movement. Wipe brush sporadically so you don’t smudge the colors. Take a thin brush and load with a contrasting color, then make “jittery” marks the other direction, roughly perpendicular to the original veins. Blend in that direction. You can use a sharper point brush or even a feather to make more unusual marks. A layer of darker or white veins will sit on the surface – blend these only slightly. 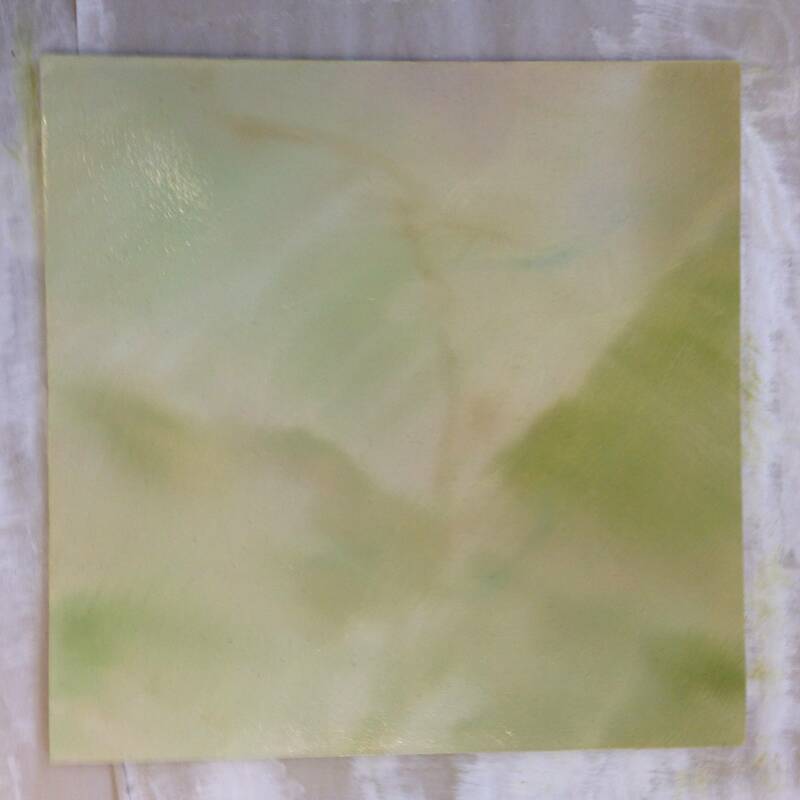 I applied a cream colored glaze layer, then worked back into the piece with various levels of blended sap green, raw sienna & white to add greater depth and knock down the brightness of the first layer.